Robison-Anton® is a premier manufacturer of high performance embroidery thread. 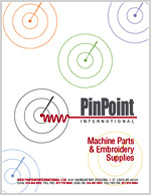 All thread is quality engineered to run smoothly on all high speed embroidery machines and utilizes unique processes such as air-splicing which eliminates knots and result in fewer thread breaks. Robison-Anton is the only company that processes and dyes Polyester and imported Rayon in one facility for optimum control. A variety of Robison-Anton threads meet the stringent MADE IN THE USA specification requirements. As a global leader in consumer safety, A&E ensures their Rayon and Polyester products meet the Oeko-Tex® Standard 100 certification which is paramount in infant & children's products and apparel. Due to the differences in printed and electronic displays, colors illustrated in catalog or website formats should be used only as a guide. Threads should always be matched to the specific manufacturer's physical color card. Please reference or purchase a Robinson-Anton Thread Color Chart.